Back in June, shortly after the final overlay of asphalt was laid for the Bank Street reconstruction, someone walked over the fresh tar and left these footprints on the sidewalk. This was on Bank Street in front of Herb & Spice, at Lewis Street, looking North toward Wilde's and Rogers at Gilmour. The bike rack at this spot was removed for repair, but they're all back now. This is the third and final installment of this week's series on the Gladstone Sports and Health Centre at 18 Louisa Street in Dalhousie. In Part 1, I talked about the history of 18 Louisa and the site on which it sits. In Part 2, I shared photos of the exterior before, during, and after recent renovations of the former school into the Gladstone Sports and Health Centre. Today, I'll show you the inside, during and after construction. Inside the front doors during construction. The roll at right is the mat/grille to be installed into the recess in the floor by the front doors. Looking out both sets of front doors. The building is accessible, and has lots of natural sunlight. Down into the lobby during construction. The elevator is to the left. The Dalhousie Food Cupboard actually uses the entrance at 399 Arlington, not the main entrance. The non-profit group is affiliated with the Ottawa Food Bank (though they also buy food in bulk), and is one of the busiest in the city, serving an inner-city area with lots of low-income individuals and families in the middle of an area with no supermarkets. Their jurisdiction is roughly the boundary of the former Dalhousie Ward: Ottawa River to Carling Avenue, Bay Street to Breezehill Avenue, between Centretown (served by Centre 507) to the East, and Hintonburg (served by the Parkdale Food Centre) in the West. The Cupboard is open Tuesdays and Thursdays. Sairah Shahid is the coordinator, but it is otherwise run entirely by volunteers. The Cupboard has been in operation for at least 16 years, previously in the basement of Erksine Presbyterian Church (now Peace Tower Church) at Bronson and MacLaren, where they paid $800/year in rent. They've been at 18 Louisa since it was the Polonia Centre, and PCL has accommodated them well throughout the renovations. The rent (now considerably more than $800/year) is covered by the City. In addition to volunteers (especially someone to help with interviews on Tuesdays), Sairah is looking for donations of containers to help distribute food purchased in bulk, including egg cartons, empty margarine containers, and plastic bags. Getting back to the tour of the building, many of the spaces are still under construction, or awaiting tenants to have them fitted out. This small space on the ground floor is one room used for swing space by the contractors. Moving to the North end of the building, the ground floor was sealed off for asbestos removal the first time I visited the site. It's now all clear of asbestos, though the stairway is exit-only, and some work is ongoing on the ground floor. These ghost marks of the school crest and noticeboard show that this used to be the main entrance. The entire wall has since been painted over in a single colour. Going up the stairs, here's the view from the third floor. There are boards covering the steps on the first flight because workers are replacing the strip of black grit near the edges of the steps, which have worn over the decades. Up to the second floor, this is the "activity room" which occupies the space of two former classrooms. In May, it was being used as temporary storage for various building materials. It is now mostly finished. There will be a few fold-up table tennis tables, and community groups will be able to rent the room at some point in the future. This is the second-floor hallway during renovations in May. As you can see, they've rebuilt the walls on one side to narrow the hallway and enlarge the Activity Room. When they finished this wall, they decorated it with some white circles. The doorway to the activity room is at the right, directly opposite the elevator. The second floor also contains dorms for the national table tennis team when they are in town, as the Canadian Table Tennis Federation is the primary tenant of the Centre. Unlike purpose-built office buildings, former schools have spacious stairways designed to accommodate large numbers of students. Unfortunately, the stairs are not easily accessed from the new main entrance, and cannot be accessed from the outside; occupants and visitors are expected to use the elevator. Nevertheless, let's take the stairs to the third floor. As this evacuation plan map indicates, the four former classrooms at the South end of the building are all still for rent, ideally by non-profit community services (or head offices of national non-profit groups). Each is about 900 square feet, and adjacent units can be joined. They are bare, and can be fitted up as desired by the tenant. Each unit has its own temperature controls (and they work very well, I can say!). In this room at the South-West corner, we can see that drop ceilings have been installed and the floor and walls have been stripped to concrete. As observed in the previous post, the two south-facing windows are new, while the West-facing window fixtures sit in the existing openings. If I seem a bit fascinated by windows, it's because my previous office looked out of windows onto a brick wall a few feet away. These are in the South-facing unit next to the gymnasium. This unit faces East, and is between the South stairwell and the kitchenette. Its floors have been finished. The hallway on the third floor is interesting, to say the least. Here's a shot of it back in May. The shiny thing on the ceiling at left is part of the HVAC system, but the thing to the right, up against the roof, I suspect is a brace or patch closing over a former roof access. As the building was built in two parts, the older part (further away in the above photo) didn't have the infrastructure for all the ductwork, so it had to be routed vertically through the hallway. These channels were covered over and painted with a playful diamond pattern. And here it is, finished. It will afford a good view of Fairview Towers during their imminent renovation. The fridge was donated by a sponsor. A table and chairs were later added for use as a lunch room. At the end of the hallway, the glass brick provides ample natural light to the stairway. The coloured bricks give it a nice decoration. Here's one of the units during renovations. The old glass bricks are stacked in the middle of the room, as they will not be re-used. On the end unit, drywall framing is being added. Tenants can also opt to save money by leaving some or all of the walls at cinder block (though cables will need to be routed in plain view). The new windows haven't yet been installed at the end of the building. Behind the framing, you can see the outline of the former chalkboards (they're also noticeable in the unfinished rooms, but behind a coat of primer). The same unit, finished and painted. It is an open-concept office that will use cubicle dividers to separate the work spaces, allowing more light to permeate the office. It has a semi-soft floor made from recycled rubber tires. By contrast, this office had five individual offices built, each with a window to channel light into the reception area. The floors were finished with European-manufactured Artline floor tiles, affixed directly to the concrete. Looking out the window, we can see the main entrance, finishing the tour just as we started it! If you're interested in volunteering for or donating to the Dalhousie Food Cupboard, pay them a visit on a Tuesday or Thursday between 11am and 2pm. If you represent a non-profit group that is interested in one of the offices at the Gladstone Sports and Health Centre (or renting the Activity room for an event), contact me and I'll put you in touch with the right people. In the previous post, I talked about the history of 18 Louisa, formerly St. Agnes Roman Catholic Seperate School. The school, after a brief stint as the Ottawa Polonia Centre, was bought by some Table Tennis groups that have converted it into the Gladstone Sport and Health Centre. They've hired PCL Construction to completely renovate the building, inside and out, and are renting the third-floor offices to other non-profit groups like the one for which I work. Today's post compares photos of the exterior of the building before, during, and after the renovations. Because it's a before-and-after post, it contains many more photos than my usual posts. As I only discovered the building part-way through renovations, I've had to rely on other sources for photos predating the work, such as Bing maps' aerial view, above. Google Street View, whose Ottawa photos are from Spring of 2009, offers a "historical" look of the building before renovations. If you click on any of the Google Street View images in this post, it will take you to that perspective in Google Street View (clicking on other photos will enlarge the photo). There are also photos in an album on the Ottawa Polonia website dating from when the site was a Polish community centre. Tune in Monday, Wednesday and Friday this week for a series of posts on the Gladstone Sports and Health Centre. If you don't have to go South of Gladstone between Bronson and Rochester, you might not know that there's a school there. I was surprised to first find it in early April of this year, by which time it had ceased to be a school, and was undergoing renovations. I took some photos, not realizing the connection I would later have with the building. 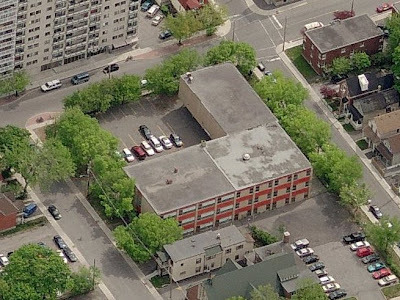 For reference, the former St. Agnes Roman Catholic school is located at 18 Louisa Street, in the block bordered by Louisa, Bell, Arlington and Lebreton. Here's a shot of the school from Microsoft Live Maps' bird's-eye view, taken before the renovations (click the photo to go to MS Live Maps--bird's eye view not available in all browsers). At the top-left of the image, you can see the Southernmost corner of the Bell Street apartments—also known as Fairview Towers and Peyton Place—which will soon be undergoing major renovations to the exterior. In the aerial view above, you can clearly see the original section of the school (lower-right of the image), and the two additions, classrooms with larger windows to the North (lower-left in the image), and an elevated Gymnasium to the East (upper-right in the image). There are scant references to 18 Louisa Street and St. Agnes School on the web, which is the extent of my research. The Ottawa-Carleton Catholic District School Board has a comprehensive history of the School Board from 1856-1997 on their website, available in flash or PDF version. 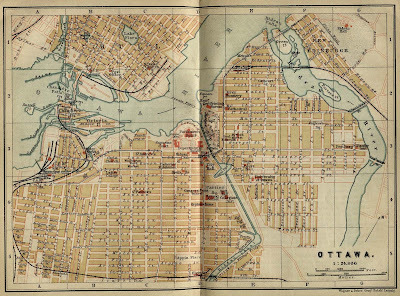 However, this crop of a 1923 map of Ottawa shows distinctive residential-sized plots on the block, suggesting the school was either very small, or located elsewhere. (The current building wasn't built until the '50s, with an extension and gymnasium added in the '60s.) The History goes on to mention that St. Agnes worked in tandem with St. Anthony's school, built in 1925 (known as Dante Academy at the time). Digging back a bit further to the 1894 map of Ottawa posted in this URBSite post, Louisa street had the same name at the time, but Bell Street was Lisgar Street (yes, there were two Lisgar streets within blocks of each other--one in Wellington ward and one in Dalhousie ward), Arlington was Munroe Street (with no connection to East-of-Bronson Arlington, then called Archibald), and Lebreton Street still had its generic name of Division Street. The building was purchased by the Polish community and was affiliated with St. Hyacinth Parish on the same block, operating as Ottawa Polonia Centre. Back in March, Eric Darwin mistakenly attributes the renovations to the Polish community centre. "The National High Performance Training Centre has a new address in Ottawa. After many years of looking for a new permanent site, Table Tennis Canada, in cooperation with [the International Table Tennis Federation] and [TMS International] are now leasing a 24 hours/day, 7 days/week training facility. The gym is equipped with brand new tables, special flooring for table tennis courts and a state of the art lighting system." The completion of renovations would later be postponed to May 2010 (PDF), and eventually to August 2010. The exterior renovations will be the subject of the next post, available this Wednesday at noon. As is widely reported elsewhere (like here, here, and here), the second crew of artisans from China has begun painting the Chinatown gateway arch in bright colours. Now that pedestrian and motor traffic is flowing more smoothly, the progress itself is becoming quite an attraction--as envisioned by the BIA. The archway will be complete in early October, and will be officially opened in a grand ceremony sometime during that month. On one day in late June, dark clouds loomed over the North part of Centretown, with clear skies further South. With the cyan reflection of the clear skies in the windows of l'Esplanade Laurier's two white marble towers, it's as though they weren't there, and Bank street was once again a two-storey 1900's main street. L'Esplanade Laurier was recently bought by Public Works and Government Services Canada for a pretty good price, but they're also plagued with problems, particularly with the white marble, which is poorly suited to Ottawa's climate or high altitudes. The patchy rain/sun patterns have played other interesting visual tricks this summer, as with the post Light Rain from late July. The community association isn't having a Board meeting until September, and unlike June and Springtime, things have been fairly quiet for the Community Association (new community garden notwithstanding). To ease us back into the groove, the CCCA is holding another Gab & Graze--a relaxed social get-together at a Centretown establishment. This month, it's at Jean Albert's*, an American-style soul food restaurant at on Somerset at Lyon that opened earlier this year. We'll be gathering on Tuesday, August 17, 2010 from around 5:30-7:30. *Bilingual Ottawans should note that it's pronounced in English, like blue jeans plus Fat Albert's. I went there with a friend in May. The menu is brief but rich. You pick an entrée and two sides--a decision that is complicated by the variety of sides available. My friend had the southern fried chicken with collard greens and black eyed peas, and I had the juicy chicken breast with candied yams and coleslaw. We didn't realize until after we'd ordered that there were several sauce options, including having the sauce baked into the food. The portions looked small, but only due to large plates. Separate containers for the sides facilitated sharing. I'm no professional foodie, but everything was enjoyable. Online reviews of the restaurant are mixed, most praising the food, but some complaining of slow service. Many of the reviews date from the first few weeks since the restaurant opened, so hopefully we'll all have a good time there. Jean Albert's is located in the house that used to be Hot Pepper's, and the Hot Pepper's banner was still up in late April. That restaurant and its owner, Luc Lapointe, made the news in 2008 when Lapointe protested the City's then-new graffiti by-law. After our meal, LeRoy and Jennifer Walden came out to say hi, and LeRoy chatted with us for a while. He talked about his vision for the restaurant, including the upstairs lounge (which has since opened), and that he wants the restaurant to be like walking into Grandma's kitchen: leave your troubles at the door, 'cause grandma doesn't want to hear about them. LeRoy is also very enthusiastic about the history of Hull and the Ottawa Valley, talking about Al Capone's Quadville, Ontario hideout, and other north-of-the-border events that took place during Prohibition. But most of all, he's passionate about food. This is the third Gab & Graze event held by the CCCA. The first two were held last year at the Atomic Rooster bar & bistro, and the Imperial tavern, both on Bank Street, to encourage people to continue to visit Bank Street during the construction. Gab & Graze is also a good way to get to know other CCCA members outside of meetings. After last week's post about a new yellow house on Arlington Avenue, I realized I had photos of other yellow houses in Centretown, which I'd might as well share. As has been documented elsewhere (specifically at Watawa Life, twice, and at Neatorama), a black zig-zag stripe was painted on the Cambridge Street North side of the house, with the words, "Grief Ain't Good," a reference to Charlie Brown's shirt and his catchphrase, "Good Grief!" The text was painted over shortly thereafter, but the black stripe left a bit longer. In this shot, with the two dormer windows, it looks more like a yellow Pac-Man ghost. I think the yellow sticker on the parking sign is a nice touch. The stripe was painted over also, leaving what should be a blank yellow canvas, but what is really a patchwork of miscellaneous yellow blotches. A couple weeks ago, I was heading down that way near sunset. The light and the sky had some very vivid colours. You can also see that the crackled paint on the window leaves some interesting shadows on the inside far wall. On that visit, I noticed these two books in the front window, amusingly titled, "Don't Wait to Buy a House - Buy a House and Wait." Looking back at my old photos, these have been there since at least May 2009, which is the earliest photo I have of after October 2008, when the windows were still painted. The next house is the home of Pierre Amelotte International, a hair loss treatment centre, right next to the Rama Lotus Yoga Centre. It used to be an ordinary enough red-brick house, until it underwent extensive renovations to add floors. The transformation isn't quite as stark as the Echo Drive house, as the original parts of the building are still red brick. This house made some cameos in this post on the Metropolitan Bible Church demolition, and its yellow rear is visible through a driveway off McLeod in this Hallowe'en 2008 post. The next one is on Bay at James: Powers House, built around 1887. It was renovated extensively in 1915 by architect Francis C. Sullivan, who added his distinctive Prairie stylings. This is just a sneak peek of the narrow side of the house; I'll do a more extensive post on this house another time. It was this photo that I saw in my "unsorted" pile that got me to write this post. 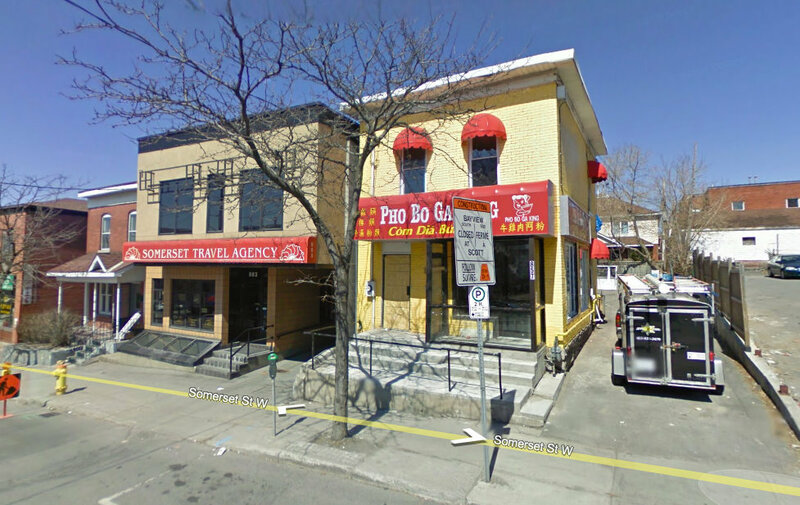 It's 857 Somerset Street West, in Chinatown (technically in Dalhousie, not Centretown). It's next door to the Somerset Travel Agency. I must have just never seen it zipping down the hill on my bike, or struggling back up it. If you know of other yellow houses in Centretown, leave a comment below!